Add an alternative offensive approach to your game plan that applies constant pressure on your opponent's defense. Legendary Loyola Marymount star Bo Kimble made a name for himself as the centerpiece of the fastest-paced, highest scoring juggernaut in the NCAA while attending Loyola Marymount University. Now, Kimble, along with Shoreline Community College Head Coach Greg Turcott, carry on the Paul Westhead tradition with a high-flying fast break game that leaves opponents gasping for air and creates wide-open layup and three-point opportunities for your offense. Witness for yourself the nuances of this "organized chaos" and discover why it can be so successful--even more so in today's era. Kimble and Turcott, install the offense for you in an easy to learn, step-by-step fashion, beginning with the alignment of the player positioning on the court, followed by explanations of the various options within the system as they pertain to each of the five players. You'll also get a series of break down drills that illustrate the options previously drawn in a whiteboard session. Drills progress from 3 v 0 to 5 v 2 action where the specific axioms required by the offense are discussed, demonstrated, and reinforced. With Coach Kimble on the whiteboard and Coach Turcott giving coaching points on the court, they combine to give a complete explanation of the system in an easily understood fashion. This scheme is designed to wear down the opponent over time and to force them to play an uncommon style of basketball. Kimble diagrams each of the individual offensive options sequentially on a white board. Each player on the court is assigned a number and that number corresponds to a responsibility for the fast break. The numbering system helps players get to areas on the court, which helps create space for the fast break offense to be most effective. Players and numbers can be interchangeable; your personnel will determine where you feel certain players would best fit. Following the whiteboard introduction, each option is shown live on court first using 5 v 0 cycle drills. These drills teach your team how to play fast by reinforcing the responsibilities and options of each player. The coaches then put their team through breakdown, continuity and sequence drills. The breakdown drills allow two to four players to focus on their options while quickly moving down court. This allows for more repetitions in their roles on the court. The continuity drill runs the team through the cycle of plays with active defense to "train the eyes" for teammate recognition and open passing lanes up ahead. The sequence breakdowns are optional passing sequences to beat adjusting defenses to the basic main plays. 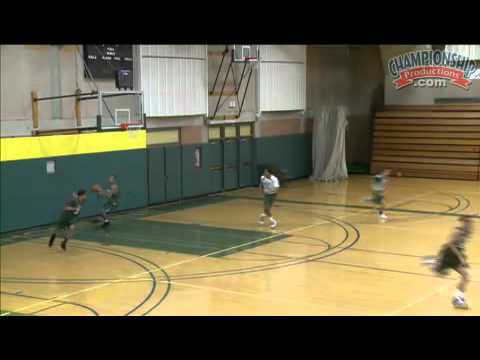 The drills covered are adaptable to individual workouts or full team situations. Once believed to be a system for only elite level talent, Bo Kimble explains and breaks down each segment of the scheme and preaches that it can be even more successful for teams with a talent disadvantage. Kimble provides his expert knowledge on the commitment level and passion required to select such a fast-paced, up-tempo, fast break offense. Sales of this video benefit Kimble's "Forty-Four for Life" foundation, dedicated to reducing cardiac arrest fatalities by placing defibrillators in public gathering places. A solid video pretty much identical to Paul Westheads video put out years ago. A numbered fastbreak, goes into good detail into the role of each player. Also shows drills to make it go. We used this as our inbounds break this season and got numerous easy baskets with this attack. It takes a little time, but once the kids understand the roles it really puts the defense on their heels. Basketball in the Fast Lane 4.00 out of 5 based on 1 ratings. 1 user reviews.